Professionally speaking, I’m a technical writer, but I’ve been dabbling with putting on some other career hats the last few months. I’ve been doing some BA and TA-type work and have been trying to learn T-SQL. I even took a continuing education course to learn about writing queries. But as simple as T-SQL appears, compared to my experience with older languages like C, Pascal, COBOL, FORTRAN, and BASIC, it becomes very complex, very quickly in actual usage. It involves layers and layers of thought. It’s like trying to wind a logic ball of yarn. Fortunately, I got a copy of Itzik Ben-Gan’s Microsoft SQL Server 2012 T-SQL Fundamentals when I took the course and I’ve been working through it from the beginning, trying to pick up the syntax. But before even getting that far, I had to figure out how to install the free version of SQL Server 2012 on my netbook and how to install the database from Ben-Gan’s website. The book is solid, though. It’s very much a light textbook and includes problems and solutions. If you want to learn T-SQL, I think it’s a good place to start. With all this background out of the way, my interest and dabbling outside my job scope scored me the chance to take a day from work to attend SQL Saturday at LSU’s E.J. Ourso College of Business. It’s basically a free conference and workshop put on by IT professionals for IT professionals. Whether you’re a developer, a DBA, a teacher, or even a tech writer, there’s something for you. I took five 1-hour courses. Four of them were pretty good and I learned a lot of neat stuff. The fifth wasn’t really helpful. I picked up a bunch of random tips and tricks, learned some stuff about SSRS, and discovered how to check the cost of my queries. All around, it was good stuff and I was pretty worn out by the end of the day. There was a free lunch (jambalaya, salad, and a snack) and a whole lot of raffling with some nice prizes, courtesy of the sponsors. I’m talking Xbox Ones, Surface Pro 3s, Mac Airs, Best Buy and Amazon gift cards, training classes, and a bunch of other stuff. Oh, and some Star Wars cosplayers showed up to help manage the raffle. So yeah, Darth Vader posed for pictures with the raffle winners, while a little girl dressed as Princess Leia did some of the drawing. I didn’t win anything, though, but got some nice swag, as far as swag goes. You just can’t go wrong with a T-shirt and a flashlight. The moral of this story: Check out SQL Saturday if and when it’s offered in your area if you’re at all involved in IT. At the very least, you’ll get a swag bag and get to do some networking. While talking up an IT conference sounds geeky, I’m about to turn things about another notch. I’ve been playing Pathfinder Society games for about a couple of years now and have met some cool people, usually guys my age that are professionals in various fields. Now, I’m not really into role playing or combat simulation as much as I enjoy the effort of collaborative story telling. So, that’s the draw for me. I also like the think tank aspect. Here’s a problem, how can you and your party members solve it with the resources at hand. For me, that’s fun. I haven’t stepped up to DM any games, however. The rules system is expansive, ridiculously so, with new classes and rules being offered and revised on a regular basis. And I don’t play all that often, maybe once or twice a month. Either I’ll show up for a PFS game at the local game store or I’ll sit down and continue to play the home campaign I’ve been running with some friends (Skull and Shackles). I don’t live and breathe the books and the stories, which is a problem. Unlike D&D, everything in Pathfinder happens in the same setting. Every novel or short story someone writes and officially publishes is part of that world. The dozens of books and adventure modules are all part of it. DMing has just seemed daunting. Period. But I’m ready to give it a try, but with a small caveat. As I’m between books and taking a bit of a break, I’m going to work on whipping up a mini-campaign to run with my usual group. I really, really loved the Distant Worlds campaign setting that Paizo published a while back, so I wanted to do something with it. 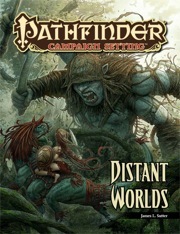 It was actually the first of the Pathfinder books I ever purchased, because it just seemed so interesting to me. The premise of the book is, yes, there is the main earth-like world (Golarion) where all the usual stuff happens, but guess what? There are another 9 planets in this solar system loaded with ancient mysteries, aliens, and evils. One of the worlds in particular, Aballon is the focus of my mini-campaign. It’s a Mercury like world, extremely close to the system star. But it’s populated by a race of intelligent machines left there for unknown reasons. The machines, solar powered, toil away on the surface, mining resources and building and rebuilding themselves. The planet also features deep wells of ice that are shaded from the sunlight and support limited organic life. The largest of the wells features an archway that is actually a portal of some sort. And it has brought dozens of people from the main world for also unknown reasons. So, there’s this barely surviving town, Horsethroat, in the pit of this frozen jungle where these people are trying to survive. And only one of them, a wizard of some power, is capable of using powerful enough magic to explore the surface safely and to communicate with the machines. Some in the town suspect he’s responsible for them ending up in this frozen hell hole. Others thing he’s just a puppet of a greater power. And a few more believe themselves to be chosen to live in this refuge while the world they came from is destroyed by wrathful gods. It’s a great little setting and it’s easy enough to drag PCs into it. I’ve been working on it on and off, developing situations and NPCs. I intend for it to be a fairly low-level affair, which is hard to do when you need to be like 9th level just to cast the magic you would need to not flash fry and/or suffocate on the surface of the planet. I also have a few things in mind that can act as bridges to more adventures if my group enjoys the experience. I can even tie it into Iron Gods (an adventure path dealing with ancient, but highly-advanced technology). So far, the biggest problem has been limiting the scope of what I want to do. There are so many mysteries in this solar system and even though I can devise scenarios and shocking explanations for how they came to be, I can’t just give those to my players. That would basically be just fan fiction. Instead, I need to just keep a basic framework in mind and flesh out the areas Paizo hasn’t really gotten to. But even then, I have to write the adventure so my players just get a potato chip at a time, so they’ll always be wanting more. If I hand them the bag, they’ll be sick of chips for a long time after.